Boston museum acquires Anne Frank's personal copy of "Grimm's Fairy Tales" for $50,000 at auction. (JTA) -- A Boston museum has acquired Anne Frank's personal copy of "Grimm's Fairy Tales" for $50,000 at auction. The book, which sold at Swann Auction Galleries in New York City, is accompanied by a 1977 letter from the girls' father, Otto, giving it provenance. The book was left behind in the Franks' Amsterdam apartment when the family went into hiding in the attic of another building in the Dutch capital. Eventually it was sold after World War II to a Dutch couple by a secondhand bookstore in Amsterdam. 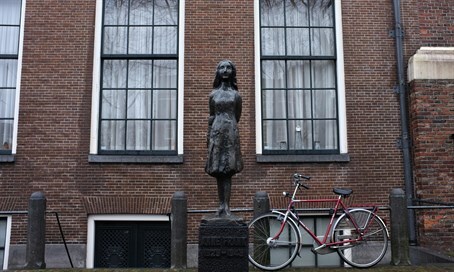 “Anne Frank is the human symbol of the Holocaust,” said Kenneth Rendell, the founder and executive director of the Museum of World War II. “Her diary is read by students everywhere throughout the world. Handwriting is the most direct connection we can have with someone, and seeing this book which belonged to her, with her handwriting on the title page, is as direct a personal connection we can have with her."